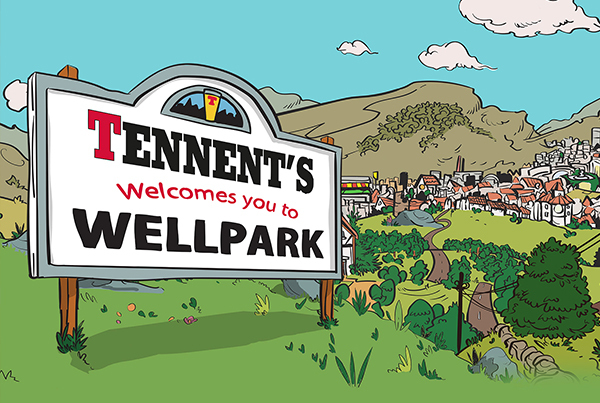 On Christmas Eve 2014, Tennent’s Lager approached us to say: “What would you do if we asked you to make us a TV ad?”. In response, we asked ourselves: “What if we applied our agile approach to advertising?” So rather than create a single, shiny TV ad, we conceived a digitally-led campaign consisting of 35 pieces of bite-sized animated content. We made executions designed not for a channel, but for single programmes and movies. We developed concepts, not set apart from the campaign in a ‘planning’ phase, but while the campaign was actually in flight, in response to real-time results and real-world events. We wanted the campaign to be seen as a content series rather than ads (like a sitcom that happens during the ad break) so we set out to entertain first and foremost. Brand messaging would be secondary to increase shareablility and the product would only ever appear where it ‘made sense’, rather than in a contrived way. Lastly, we aimed to capture viewers’ attention and imagination by being relevant, unexpected and original. Creating 35 animations in just 10 weeks demanded a different approach to production. Studio Something produced the animations, deploying a writing and animation team full time. And to speed up dialogue and sign-off we embedded Tennent’s marketing manager in Bright Signals’ studio two days a week, while a Republic of Media planner/buyer was based with us full-time. Completing the cross-agency team were Wire, who handled PR. Wellpark was a resounding success. The campaign won the Advertising category at the 2016 Marketing Society Star Awards, as well as a bunch of other awards. More than 17,000 press stories appeared about it (everywhere from The New Yorker, to Radio 1, to The Today Show) generating a global OTS in excess of 1 billion. But most importantly, Wellpark drove estimated sales of more than 2.1 million additional pints.